My husband Jon and I met online in April 2009 … but I knew Jon before our first introduction ever happened. I knew him because God disclosed to me information about my future husband, giving me plenty of interesting details about the man I would one day marry. The only detail He never gave away was his name. Life as a divorced mom in rural Louisiana was hard. I felt out of place at church and community functions. At home, I just felt lonely. I deeply longed for companionship. I had spent nearly two years working to heal and recover from my divorce. Even so, I wasn’t sure I was really ready to face the dating world again. Besides, I lived in rural Louisiana. The only available single men at my church were a few widowers, most of them old enough to be my father. The options seemed limited. Online dating? Wasn’t that for losers who couldn’t find dates in person? And wouldn’t it feel rather impersonal, sort of like shopping online, only for a husband instead of a dress? I had concerns online dating would work for me, and yet my curiosity had been piqued. After nearly a month of toying with the idea, I finally decided to give it a try. If I had any expectations for what might happen, those were soon dashed by a steady stream of men who told half-truths. Truthfully,I don’t know what I was expecting to happen after that prayer, but I can tell you that what did happen was definitely not what I was expecting. Over the period of about a week, God began answer me, revealing qualities I should look for when I considered whether or not a man worth dating and eventually marrying. At any rate, I was surprised when God started to respond to my concern. Some things God told me to look for were relative no-brainers for any woman seeking to find a Christian husband. He should be a Bible reading, church going, prayer warrior kind of guy. A generous giver. Involved in a ministry, either through his church or some other Christian organization. More specifically, God divulged He had picked a man who was more than two years older than me. He would also be tall, standing well over six feet, with dark hair and hazel green eyes. My future husband would be musically inclined and have a voice that was pleasant to my ears. Then came the last two details, so specific it both baffled and excited me a the same time. God told me the man I would one day marry would ask to pray with me regularly from the very beginning of our dating relationship. Last, but not least, he was going to be such a gentleman that he would ask permission before he kissed me the first time. Before the end of the week, there were three pages were of details written in my journal. God shared over 35 different character traits, leaving me to feel as if I were searching for a needle in a haystack. And truthfully, I didn’t believe such a man possibly existed. My God-given list is originally dated for April 8, 2009. Before a month had passed by, Jon introduced himself to me via the online dating community. Oddly enough, I had already decided to no longer continue my membership to that website, but still had another few weeks before my subscription would expire. I had quit going to the website with any regularity because of my previous experiences as well as my decision to let God introduce me to my future husband. For that to happen, I figured God would have to move me to the moon before I would meet the man who possessed all the qualifications on my list. Still, when I saw the email notification, I took the time to log in on the website and read it. It wasn’t love at first site … or first read. But I found the email to be chatty and somewhat witty, so I replied. He replied back to me. I replied again. Initially, we mostly talked about God and our relationship with Him. I could tell Jon was a man who knew God quite well, and I found that to be a trait I really liked. One night, as I was replying to his latest email, he sent me an instant message. Talking in “real time” turned out to be just as fun. He was quick, intelligent, well-spoken (err … written, I should say). Soon, we were exchanging emails 3-4 times a week and chatting through instant message every few days as well. When my membership to the online dating community ended, Jon and I decided to keep in touch via Facebook. Spring turned into summer; summer turned into fall. By mid-September, we were communicating on a near daily basis, though emails, instant messages, and phone conversations. Our friendship was definitely growing, but there were still no hints of romance kindling. We were just two people who loved to talk, mostly about God, but other things as well. In fact, it wasn’t until my counselor again brought up the topic of dating, asking me if I thought Jon might soon ask me on a date, that I even thought of the possibility of something more than a friendship. Suddenly, I felt unsure and awkward. Why did Jon talk to me so much? Was this only a friendship, or was there something more? I pulled out my journal and flipped back to those pages. As I read down the list, it was as if I could place check marks beside more than half of the qualities. Jon was 6’3″, with dark brown hair and hazel-green eyes. He played guitar, led worship at his small church, and participated in many church ministries. So far he was matching up pretty well to the standard God had given me, but I couldn’t really tell. After all, some of the items in my long list were things I didn’t yet know. So I did all I knew to do … pray and ask God to show me! It wasn’t long afterward when Jon telephoned me. He seemed to be not his normal self, as if perhaps he had something on his mind. Soon enough, it all came tumbling out. I was stunned. In that moment I knew deep in my heart … Jon was God’s man for me. What I didn’t know was there would still quite a bit of journey left before I would become Mrs. Jon Hamilton … but before the I Do’s were said, nearly everything on the list of things God revealed to me came to pass. 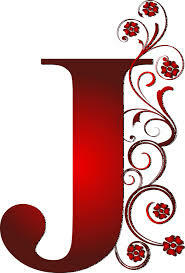 J is for Jon … my husband, who God personally picked out for me. Next up is the letter K, which stands for the kiss … the first kiss that never was and the second chance that made it right. I liked this love story! It just goes to show if you tell it to God first you really can’t go wrong, if you listen to Him. Stopping by from A to Z challenge, and this was a heartwarming love story! A remarkable story, yet, very predictable when you understand God is involved. Sweet story, looking forward to reading your next entry.